The Wobbly Barn is the steakhouse of your dreams – with its big steaks, big salad bar and big tables, where big groups can go for a big, fantastic meal. This is big time. Are we sensing a theme? Happy Hour generally runs from 4 to 7 p.m. in the restaurant’s bar and in the upstairs nightclub. Upstairs nightclub, you say? At the Wobbly, you receive free admission to the nightclub when you dine at the steakhouse. Exceptions do apply, such as if you are too young to party or a special event is taking place. Here in Killington, anybody who’s anybody hits the Wobbly when the lifts close and the sun goes down. After all, where else can you have a great dinner and enjoy a wild night of dancing under one roof? You might have trouble believing this rowdy late-night crowd will ever get out of bed to ski the next day … but chances are, they’ll be the first on the lift in the morning. What’s in a name? The Wobbly Barn was built from a collection of assorted barn pieces from across New England. But no matter how much the dance floor shakes, it’s not falling down. The Wobbly’s been here since 1963 and shows no sign of going anywhere. People love the loud, live music all year long. They also host fun events, like the annual New Year’s Eve party. Dining in? Popular dishes to try include the Surf and Turf, Beef Tenderloin Oscar, Ahi Tuna or Short Ribs. Quieter hours for a relaxed or romantic meal are from 4:30 to 6 p.m. or after 9 p.m.
And please, if you’ve had one too many, take advantage of the free Wobbly Wagon shuttle service to bring you home to the Killington Mountain Lodge. Just dial 1-800-VIP-BARN for free transportation on Fridays and Saturdays. 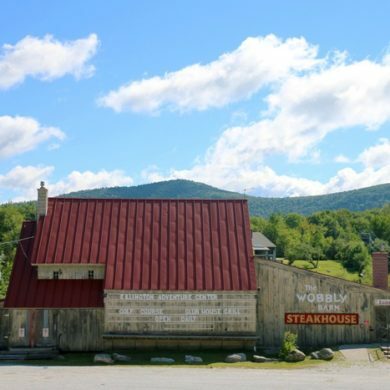 The Wobbly Barn is located at 2229 Killington Road in Killington VT. For more information, please visit the Wobbly Barn website or call (802) 422-6171.